Pink Pontiac In The ‘Sack! | Sack-Vegas!!!! Pink Pontiac In The ‘Sack! I had to stop and snap a pic of this. 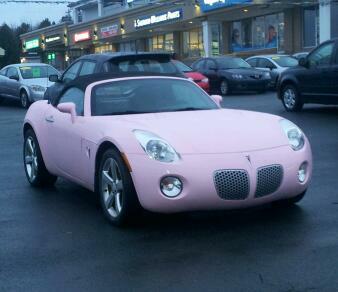 Bryden Financing & Auto Sales has this Pink Solstice on the lot. It’s a nice little ride for a pink loving Sackvegas Gansta or maybe one of our ladies…..who knows? Reminder: I am always looking for cool vehicle pics for my “Rollin’ in the ‘Sack” section. Posted by Sacky on April 25, 2013 in Rollin' In The 'Sack.